What is the Voting Rights Act? How did it impact the right to vote? Where does the fight for the right to vote stand today? How is People For fighting for the right to vote? What can I do to defend democracy? Democracy in America would not exist without the right to vote. Yet being able to cast a ballot that counts is one of the hardest-fought battles in American history, and one that still rages on today. Untold blood was spilled by the foot soldiers of the civil rights movement, who risked their lives to secure the right to vote for African Americans. Even after they won the Voting Rights Act of 1965, this “crown jewel” of the civil rights movement was gutted by a devastating Supreme Court ruling in 2013 that sent a chilling message to African Americans, the Latino community, people with disabilities, students, and many others who continue to face politically-motivated hurdles when voting. The Right has been whipping up hysteria about mass illegal voting that simply doesn’t exist, and continues to use it to fuel an onslaught of voter suppression laws—all to keep certain people from exercising their right to vote. 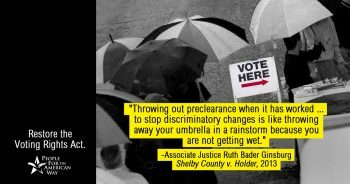 In the following report, we outline the importance of the Voting Rights Act (VRA), provide a snapshot of the current voting rights landscape, and share tools and examples of how activists are fighting to protect this sacred right. 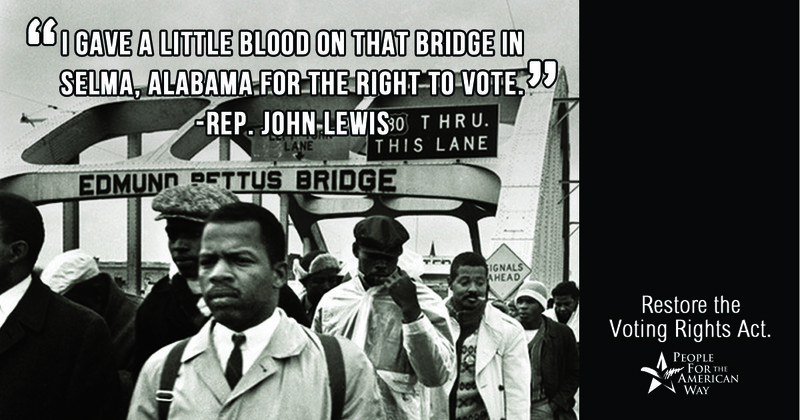 At People For the American Way, we are calling on Congress to restore the Voting Rights Act. We are pushing back when voter suppression rears its ugly head. But we also have reason to hope. We have seen courts come to the defense of voters and shut down voter suppression. We have seen state and local victories that open up the right to vote to more Americans. And we have been on the frontlines of change. Our affiliate PFAW Foundation’s Young People For and African American Ministers Leadership Council have prioritized civic engagement and trained their members to organize their own communities, and the Young Elected Officials Network has also seen its members speak up and take action on behalf of democracy. So have you: activists standing up in their own communities are the “we the people” that democracy today so desperately needs. 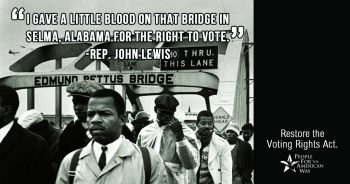 Bloody Sunday was a turning point in the fight for the right to vote. 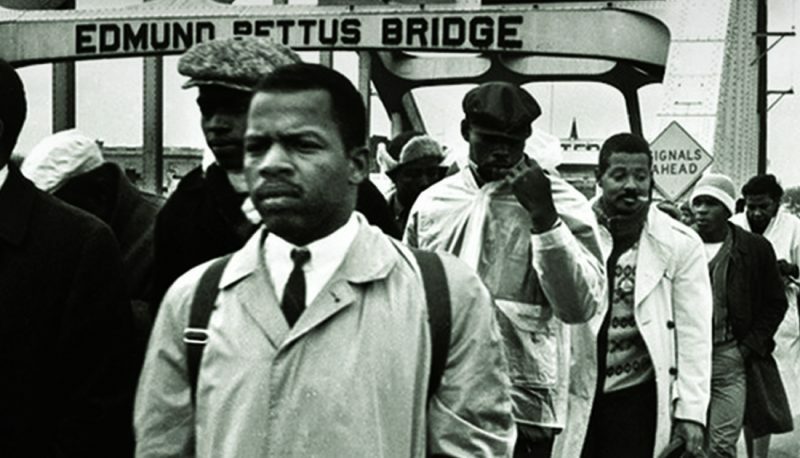 On March 7, 1965, six hundred foot soldiers of the civil rights movement set out on a march from Selma to Montgomery in Alabama to honor Jimmie Lee Jackson, who had been murdered just days prior, and to continue their long-fought battle for the right to vote for African Americans. As they crossed Selma’s Edmund Pettus Bridge, they were met by an armed posse mobilized by Dallas County Sherriff Jim Clark. The attack left 58 injured, including then twenty-five-year-old John Lewis, chairman of the Student Nonviolent Coordinating Committee (SNCC). Two more attempts were made later, and the marchers finally made it to Montgomery on March 25. The primetime news coverage afforded Bloody Sunday shined the brightest light yet on the violent obstacles placed between African Americans and the ballot box. Action was swift. On March 15, 1965, President Johnson spoke about voting rights before a joint session of Congress. Five months later, the President was back at the Capitol for the signing of the Voting Rights Act of 1965. The Voting Right Act (VRA) provided several tools to remedy voting discrimination against African Americans, and has since come to serve a wide range of minorities and vulnerable populations, including the Latino community, people with disabilities, and students. One of its most important tools has been Section 5, which keeps a watchful eye on states with a discriminatory history. Known as “preclearance,” this section requires certain states with a history of disenfranchising voters to get any new voting changes “precleared” before those changes can go into effect. The government, either the attorney general or a federal court, must say that the proposed changes do not discriminate. This part of the law, along with other temporary provisions including those that provide assistance to voters who have difficulty speaking English, was renewed and extended with broad bipartisan support multiple times, most recently in 2006. Congress was tasked by the Court with determining, again, the appropriate coverage areas for preclearance. But this time, in spite of its strong past support for the Voting Rights Act, as well as the broad support of Americans of all political stripes, Congress refused to act. Though legislation known as the Voting Rights Advancement Act was introduced in both the House and Senate in 2015, the 114th Congress adjourned with neither chamber having taken committee or floor action. For years the Right has been whipping up hysteria about mass illegal voting that simply doesn’t exist. Under President George W. Bush, the Justice Department launched a war on voter fraud that yielded just 86 federal convictions out of nearly 200 million federal general election ballots cast between 2002 and 2006. That’s just 0.00004 percent, and even that tiny percentage included several cases unrelated to voters impersonating other voters, the type of fraud most loudly decried by the Right. Fast forward to 2014, when a comprehensive 14-year study published in The Washington Post found an even more staggeringly low rate. Thirty-one impersonators out of more than one billion ballots cast. In case you’re wondering, that’s 0.0000031 percent. Even that is probably overstated, given that the study’s author counted all credible fraud claims and did not just look at prosecutions or convictions. Then The New York Times took a look at the 2016 presidential election: nearly 138 million votes cast and not a single state reported widespread voter fraud (only Kansas didn’t respond). Two states on the high end, Tennessee and Georgia, reported fraud at rates of 0.00093 percent and 0.00061 percent, respectively. Twenty-six states and DC reported zero credible fraud allegations. This doesn’t mean that voting in America isn’t without its problems. A 2012 research report commissioned by the Pew Center on the States uncovered 24 million invalid or inaccurate voter registrations, including deceased voters and people registered in more than one state. There’s no question, as Pew noted, that our outdated system is desperately in need of modernization, but as Pew and countless others have pointed out, dead voters and duplicate registrations are not in and of themselves evidence of fraud. Having invalid or inaccurate voter registrations does not mean that ineligible voters are in fact casting votes. As noted above, any number of investigations have turned up a de minimis number of instances. Continuing to chase the mythical problem of widespread voter fraud is a dishonest distraction from the real voting problems that we need to solve. Yet in 2017 this right-wing cause célèbre carries on, its flames fanned by President Trump and Vice President Pence. Undaunted by the earlier Bush administration investigation that found next to nothing to be concerned about on fraud, the Trump administration used its first months in office to lay the groundwork for a new White House task force to go after things that aren’t even fraud. The Right has used its trumped-up claims of voter fraud to fuel an onslaught of new and ever more suppressive voting laws—to the tune of at least 87 bills introduced in 29 states in the first three months of 2017. They continue to claim rampant voter impersonation as false justification for demanding that voters provide identification in order to cast ballots that count—knowing full-well that ID requirements are often restrictive and hard to meet, impossible for some, and will succeed only in stripping otherwise eligible citizens of a fundamental democratic right. Seven states have set an especially high bar, requiring photo identification without giving voters a failsafe should they show up without ID, instead requiring additional steps post-election. Several new ID efforts were launched in 2016, and still more are on the way in 2017: According to the Brennan Center, ID proposals came up in early 2017 in Arkansas, Iowa, Nebraska, and North Dakota—just to name a few. Casting ballots on a single Tuesday each election cannot meet the needs of all people who are eligible to vote and want to participate but have competing demands on their time. Right-wing politicians have also placed limits on opportunities to vote, including early voting cutbacks that reduce or eliminate this valuable alternative to Election Day voting. Casting ballots on a single Tuesday each election cannot meet the needs of all people who are eligible to vote and want to participate but have competing demands on their time. Absentee and early voting have helped ease these burdens, not just as a matter of convenience, but as fundamental accessibility solutions. Even where progress has been made, the Right has come back and tried to slam the door shut. North Carolina’s monster voter suppression law passed in 2013, for example, went after early voting. After a court found discrimination in this and other state-level provisions, local election officials still went ahead and reduced early voting hours at the local level. As if these and other legislative attacks weren’t enough, the Right has used dirty tricks to keep certain people from exercising their right to vote. We hear stories of deceptive practices and intimidation every election cycle that attempt to disenfranchise vulnerable communities. The 2012 election certainly featured some outrageous tactics to attempt to suppress the vote: Elderly voters told that they could vote over the phone; African American and Latino voters told that car insurance and registration status would be checked at the polls; ominous billboards; and the exploits of partisan challengers. But 2016 was perhaps a new low, when we saw threats of racial profiling at best and assassination at worst. Though the obstacles erected by voter suppression are many, and we have a lot of work left to do to push back, there have been victories that offer hopeful signs of voting rights progress. Ohio, for example, had earned a reputation as a perennial voting rights offender. Between 2010 and 2015, two million voters were removed from the state’s voter rolls. Some of those purges were indeed legitimate, including people who moved out of state or died, but many others were illegal. At first Secretary of State John Husted refused an adequate fix to restore as many of those voters as possible. Then just two weeks before the 2016 presidential election, a federal court said that Secretary Husted could not rely on half measures that did little to right the purge’s proven wrongs. Maryland and Virginia both saw successes in 2016 in the area of restoring the right to vote for formerly incarcerated people. Though Governor Larry Hogan had earlier vetoed legislation restoring Marylanders’ right to vote during parole and probation, the Maryland General Assembly was able to override his veto and enact the new law. Governor Terry McAuliffe, on the other hand, put his signing pen to good use. After his first attempts at a blanket declaration of Virginians’ voting rights were blocked by the state supreme court, he then took to individual rights restorations for the more than 200,000 formerly incarcerated people impacted in his state. Virginians will have to remain vigilant. Not only have voting rights advocates won when playing defense, we have gone on the offense to expand access to the ballot box. Proactive legislation became law in 2016, and more is on the way in 2017, with at least 478 bills introduced in 43 states to start the year. Automatic voter registration (AVR) is one such bright spot, wherein eligible citizens accessing government services can automatically register to vote unless they opt out. This takes the old “motor voter” law one step further. Now the opportunities are far more expansive and efficient than remembering to sign up while getting your driver’s license. Oregonians can attest to this. Alaska, California, Connecticut, Vermont, and West Virginia round out the list of AVR early adopters. On the day that the Supreme Court announced its Shelby County ruling, affiliate PFAW Foundation condemned the decision and called on Congress to restore the Voting Rights Act of 1965 (VRA). People For the American Way took up the cause on Capitol Hill and ever since has been fighting in partnership with a coalition of allies for restorative legislation. 2015 marked the VRA’s 50th anniversary and a flurry of new activity. PFAW signed on in support of the Voting Rights Advancement Act, which would modernize the preclearance formula for federal oversight and make additional, critical updates. At a rally in Roanoke, Virginia, home to House Judiciary Committee Chairman Bob Goodlatte, PFAW’s director of African American Religious Affairs Minister Leslie Watson Malachi spoke alongside other esteemed leaders and activists. Though the 114th Congress adjourned with neither chamber having taken committee or floor action, we are continuing to mobilize citizen cosponsors in the 115th Congress. People For the American Way is also part of the ongoing pushback against the voter fraud myth and the onslaught of voter suppression laws stemming from it. In 2017, our activists and our president added their voices to the chorus calling for an end to the Trump–Pence voter fraud witch hunt. PFAW organized a petition that not only calls out the administration’s lies about voter fraud but also calls instead for a voter suppression investigation. And when the Michigan legislature considered a restrictive voter ID change at the end of 2016, Revered Dr. Steve Bland of our African American Ministers In Action (AAMIA) program spoke out, saying that “it’s clear that the main motivation of those backing this new provision is to harm our democracy, not protect it.” Thankfully, that suppressive attack stalled before passage. We have celebrated voting rights victories and supported proactive policies that address what's really wrong with voting in America. Young People For (YP4), a program of affiliate PFAW Foundation, is a national leadership development program for college-aged students that works to identify, empower, and engage the newest generation of progressive leaders. One of the cornerstones of YP4 is the YP4 Vote Program, a nonpartisan voter mobilization effort to increase the participation and representation of young people, particularly from communities that have been marginalized in the political process. By providing its Vote Fellows with in-depth trainings on how to run a get-out-the-vote campaign, YP4 is building a base of engaged, well-trained, and effective organizers that will have a lasting impact. The 29 Fellows in the 2016 Vote Program mobilized over 10,000 people to get out and vote through various community or campus events, including voter registration drives and an “Arrive With Five” pledge program in which voters pledged not only to get out and vote but to bring five friends or family members with them to the polls. They also organized around the systemic barriers that have kept marginalized communities from voting and discussed creative ways to engage those who still cannot cast a ballot. In total over 60 events were held across the country, with over 200 new organizers trained along the way. In Massachusetts, Colleen Fonseca worked through the Suffolk County sheriff’s office to register to vote and get absentee ballots to hundreds of eligible citizens making their way through the criminal justice system, including pretrial detainees and those convicted of misdemeanors. Corey Dutton of Kentucky followed Fonseca’s lead, incorporating outreach within the criminal justice system into her work that also included Arrive With Five pledges and a civic participation panel featuring disenfranchised citizens. Kate Black took her Vote work in North Dakota straight to the Native water protectors at Standing Rock, using Arrive With Five as an awareness campaign and providing voting reminders and other important voting information. The list goes on. African American Ministers Leadership Council (AAMLC), a program of affiliate PFAW Foundation, believes that churches are called to be centers of caring and action, and that religious leaders are called to lead by example. Since 1997, AAMLC members have answered the call by giving pastors and ministry lay leaders tools and access to mutual support for strengthening congregational and community participation in civic life. Many members have participated in AAMLC’s VESSELS Vote! initiative, a nonpartisan voter mobilization effort to increase civic engagement through empowerment measures and address voter suppression tactics that target vulnerable communities. VESSELS seek to maximize the participation of informed African Americans in the electoral process in every special, local, state, and national election. In 2016, VESSELS Vote! participants worked with 1,100 churches in 13 states to distribute VESSELS literature, provide early voting and Election Day rides, train new VESSELS to work in their own communities, and host “Why Vote” rallies. The faith-based VESSELS civic engagement model was also represented in four national and state-based civic engagement coalitions and at the annual conferences of five historical Black Church denominations. The VESSELS volunteer base crossed generational lines and incorporated hundreds of youth and senior citizens. In total, the 2016 programming mobilized over 400,000 people. In Florida, Elder Lee Harris took his VESSELS campaign in Duval County and turned it into a year-long “field of service.” Throughout 2016, he organized ten trainings and voter suppression forums. As part of his efforts, organizations worked with churches and the Nation of Islam to assist over 15,000 people in registering to vote. Elder Harris and AAMLC Florida were also very active with the voter registration deadline extension following Hurricane Matthew. Dozens of vehicles and volunteers canvassed Duval County to get the word out about Election Protection and rides to the polls, and more than a hundred students at historically black Edward Waters College received rides to the polls during early voting. In total, more than a thousand people voted early during “Let My People Vote” and “Souls to the Polls” Sundays or were assisted with Election Day voting through these efforts. In recent years we have seen an onslaught of legislative attacks on the democratic process and the rights of voters. We face more money in politics than ever before, the loss of a key provision of the Voting Rights Act, and continued efforts to disenfranchise voters in states across the country. There is also a growing body of research indicating that our government responds to and represents its donors and moneyed interests over the will of the people. It is a critical time for Americans to reclaim the democratic process and make it truly “of, by, and for” the people, through innovative voter registration and modernization initiatives, campaign finance reforms, and renewed civic engagement. California Assemblymember Luis Alejo supported the state's automatic voter registration law that registers eligible voters when they obtain or renew a driver's license or state ID card. Young elected officials work together in this and other issue areas to flesh out a shared policy agenda, and the 2015 edition of the YEO Policy Book is a clear demonstration of the network’s continued interest in democratic reforms that undergird our entire political system. At the state level, California Assemblymember Luis Alejo supported the state’s automatic voter registration law that registers eligible voters (with the opportunity to opt out) when they obtain or renew a driver’s license or state ID card. At the local level, Hyattsville, Maryland Councilmember Patrick Paschall was a leader in the successful effort to open Hyattsville city elections up to sixteen and seventeen-year-old voters. School board members also pushed for democracy reforms: Broward County, Florida has a voter registration drive partnership between the county’s public schools and its elections supervisor. Stop Trump’s delusional ‘voter fraud’ witch hunt, investigate voter suppression instead! Donald Trump is calling for a witch hunt into alleged “voter fraud” in the last election. Add your name to tell members of Congress and other public officials to stand against this witch hunt and investigate the real problem of voter suppression instead. Tell Congress: Pass the Voting Rights Advancement Act! 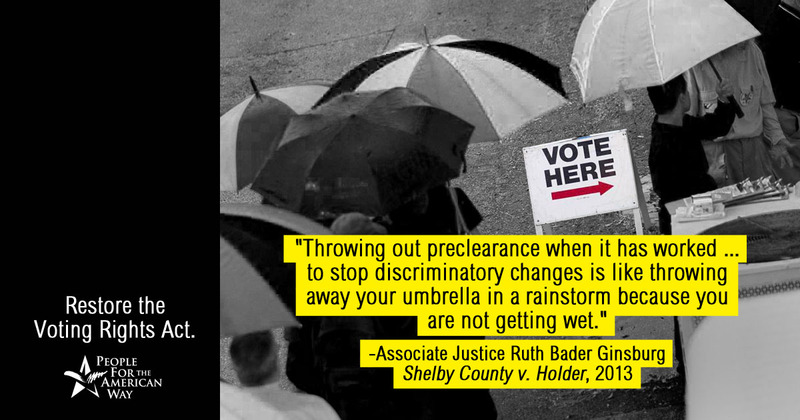 The Supreme Court eviscerated a key section of the Voting Rights Act with its 5-4 decision in Shelby County v. Holder. We need to restore full strength to the Voting Rights Act without delay. Then keep checking in with our action center for new ways to engage with us on voting rights and other critical progressive issues. You should also engage directly with your U.S. House and U.S. Senate members and state and local legislators so that they know that their constituents care about democratic reforms. Our lobbying guide and talking points can help you shape your voting rights advocacy. Writing letters to the editor and op-eds is also a great way to reach your legislators and raise voting rights awareness within your community. You can use this media guide for tips on submitting a letter, and our friends at American Promise have a newspaper directory that helps you find the right place to submit your letter. Local organizing is on the rise, with many people getting involved in 2017 for the first time in their lives, so get out there and join them to spread a pro-democracy message. Have you checked out Indivisible, Town Hall Project, and OurStates? What about affiliate PFAW Foundation’s YP4 Vote Program and the Campus Vote Project? And with voting rights and racial justice so closely linked, also consider Showing Up for Racial Justice—white people working as part of a multi-racial majority for justice. Once connected, there are so many things that you and your local group can do together to protect the right to vote. Get informed about voting in your state, and make sure that your community is just as ready as you are to cast a ballot that counts. For example, you can “arrive with five” on Election Day, or come up with a plan for giving those in need rides to the polls on Election Day.